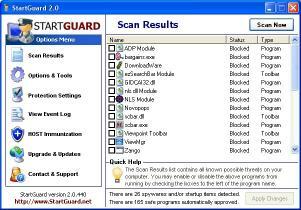 StartGuard (Free Edition) catches spyware overlooked by other anti-spyware tools. 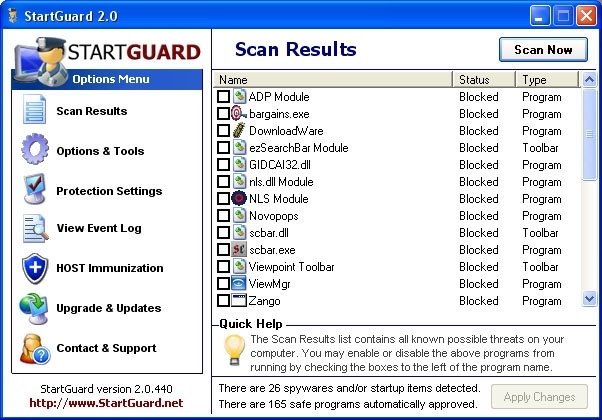 By utilizing a unique spyware detection method StartGuard will complete a full spyware scan in less than 10 seconds.Automatic Startup Protection ensures a spyware-free system when you turn on or restart your computer and Real-time Protection quietly monitors your system in the background alerting you of new threats immediately upon detection.StartGuard provides protection against all kinds of threats and annoyances including spyware adware trackware malware key loggers Trojan horses worms browser hijackers extra toolbars hijacked homepages tracking cookies banner ads text ads popups and even threats not yet identified.If you are not using StartGuard you are not protected from the absolute latest threats nor from custom-crafted worms Trojans and key loggers. You may even use StartGuard to immunize your system by blocking access to over 10000 sources of spyware adware advertisements tracking cookies popups and other threats from ever reaching your computer.You should notice a significant performance boost in Windows loading time and web browsing speeds as StartGuard loads only approved programs and blocks 90% of web advertisements.Download StartGuard (Free Edition) now to check your PC for spyware and other threats.